Clockwise frae tap: U.S. Marines retreatin n the Battle o Chosin Reservoir; U.N. landin at Incheon harbor, stairtin pynt o the Battle o Inchon; Korean refugees afore an American M26 Pershing tank; U.S. Marines, led bi First Lieutenant Baldomero Lopez, landin at Incheon; F-86 Sabre fechter aircraft. Note: The figures vary bi soorce; peak unit strength varied durin war. ↑ As per airmistice agreement of 1953, the opponin sides haed tae "insure a complete cessation o hostilities an o aw acts o airmed force in Korea till a final peacefu settlement is achieved". ↑ Laura Desfor Edles (28 May 1998). Symbol and Ritual in the New Spain: The Transition to Democracy after Franco. Cambridge University Press. p. 32. ISBN 0521628857. ↑ "Cinnost CSLA za valky v Koreji... | Ross Hedvicek ... Nastenka AgitProp" (in Czech). Hedvicek.blog.cz. 27 July 1953. Retrieved 7 November 2011. ↑ "Romania's "Fraternal Support" to North Korea during the Korean War, 1950-1953". Wilson Centre. Retrieved 24 January 2013. ↑ Tim Kane (27 October 2004). "Global U.S. Troop Deployment, 1950-2003". Reports. The Heritage Foundation. Retrieved 15 February 2013. ↑ Rottman, Gordon L. (2002). Korean War Order of Battle: United States, United Nations, and Communist Ground, Naval, and Air Forces, 1950-1953. Greenwood Publishing Group. p. 126. ISBN 9780275978358. Retrieved 16 February 2013. A peak strength of 14,198 British troops was reached in 1952, with over 40 total serving in Korea. ↑ "Land of the Morning Calm: Canadians in Korea 1950 - 1953". Veterans Affairs Canada. Government of Canada. 7 January 2013. Retrieved 22 February 2013. Peak Canadian Army strength in Korea was 8,123 all ranks. ↑ 10.0 10.1 10.2 Edwards, Paul M. (2006). Korean War Almanac. Almanacs of American wars. Infobase Publishing. p. 517. ISBN 9780816074679. Retrieved 22 February 2013. ↑ 11.00 11.01 11.02 11.03 11.04 11.05 11.06 11.07 11.08 11.09 11.10 11.11 11.12 11.13 11.14 11.15 11.16 11.17 11.18 11.19 11.20 11.21 11.22 11.23 11.24 11.25 "Casualties of Korean War" (in Korean). Ministry of National Defense of Republic of Korea. Archived frae the oreeginal on 2013-01-20. Retrieved 14 February 2007. ↑ 15.0 15.1 "U.S. Military Casualties - Korean War Casualty Summary". Defense Casualty Analysis System. United States Department of Defense. 5 February 2013. Retrieved 6 February 2013. ↑ "Records of American Prisoners of War During the Korean War, created, 1950 - 1953, documenting the period 1950 - 1953". Access to Archival Databases. National Archives and Records Administration. Retrieved 6 February 2013. This series has records for 4,714 U.S. military officers and soldiers who were prisoners of war (POWs) during the Korean War and therefore considered casualties. ↑ 18.0 18.1 Office of the Defence Attaché (30 September 2010). "Korean war". British Embassy Seoul. Foreign and Commonwealth Office. Retrieved 16 February 2013. ↑ "Korean War WebQuest". Veterans Affairs Canada. Government of Canada. 11 October 2011. Retrieved 28 May 2013. In Brampton, Ontario, there is a 60 metre long "Memorial Wall" of polished granite, containing individual bronze plaques which commemorate the 516 Canadian soldiers who died during the Korean War. "Canada Remembers the Korean War". Veterans Affairs Canada. Government of Canada. 1 March 2013. Retrieved 27 May 2013. The names of 516 Canadians who died in service during the conflict are inscribed in the Korean War Book of Remembrance located in the Peace Tower in Ottawa. ↑ Aiysha Abdullah; Kirk Fachnie (6 December 2010). "Korean War veterans talk of "forgotten war"". Canadian Army. Government of Canada. Retrieved 28 May 2013. Canada lost 516 military personnel during the Korean War and 1,042 more were wounded. ↑ Ted Barris (1 July 2003). "Canadians in Korea". legionmagazine.com. Royal Canadian Legion. Retrieved 28 May 2013. Not one of the 33 Canadian PoWs imprisoned in North Korea signed the petitions. "Behind barbed wire". CBC News. 29 September 2003. Retrieved 28 May 2013. ↑ "Two War Reporters Killed". The Times. London, United Kingdom. 14 August 1950. ISSN 0140-0460. ↑ Rummel, Rudolph J. (1997). Statistics of Democide: Genocide and Murder Since 1900. Chapter 10, Statistics Of North Korean Democide Estimates, Calculations, And Sources. ISBN 978-3-8258-4010-5. ↑ 26.0 26.1 Hickey, Michael. 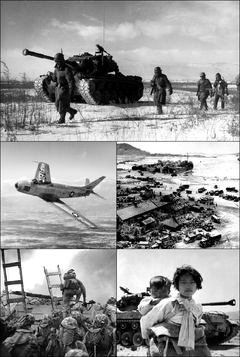 "The Korean War: An Overview". Retrieved 31 December 2011. ↑ Li, Xiaobing (2007). A History of the Modern Chinese Army. Lexington, KY: University Press of Kentucky. p. 111. ISBN 978-0-8131-2438-4. ↑ Krivošeev, Grigorij F. (1997). Soviet Casualties and Combat Losses in the Twentieth Century. London: Greenhill. ISBN 1-85367-280-7. ↑ "US State Department statement regarding 'Korea: Neutral Nations Supervisory Commission' and the Armistice Agreement 'which ended the Korean War'". FAS. Retrieved 4 January 2011. ↑ "North Korea enters 'state of war' with South". BBC News. 30 March 2013. Retrieved 30 March 2013. This page wis last eeditit on 15 August 2018, at 13:56.